Ocean & Golf Course Views - Emmalani Court at its Best! Emmalani Court is a 42-unit condominium complex located in Princeville, on Kauai's north shore! This beautiful property is an end unit located on the second floor, and is the largest 2BR/2BA floor plan in the complex - just under 1500 SF of living space. Entering the foyer, you look through the main living space to the 8th fairway of the Makai Ocean Golf Course. Green fairways, an ample offering of sand traps, and the 6th & 7th fairways beyond. This spacious condominium offers two bedrooms and two baths. The first bedroom is furnished with two twin beds & the bath 'in-suite' - offering guest privacy. The second bedroom with a king sized bed and adjacent bath with walk-in shower can be closed off to the main living area with 'pocket' doors. The two separate suites are air-conditioned for our guests! 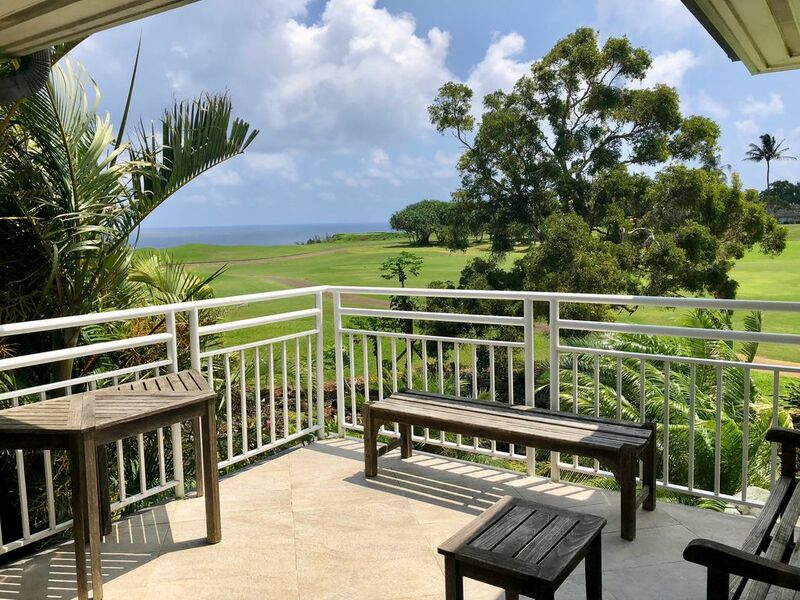 The beauty of Kauai's north shore is framed in the living room by the large floor to ceiling and wall to wall windows opening to the expansive view of the Pacific Ocean and the Princeville Makai Ocean Course. The well-equipped kitchen is perfect for vacation entertaining! Enjoy the community hot-tub and pool just a few steps from your door. There is also a party room with full kitchen and outdoor barbecues adjacent to the swimming pool. Princeville offers 45 holes of championship golf! Special rates available to resort guests. Each of the bedrooms has A/C. Off-street, some covered parking available. With lanai overlooking the golf-course and ocean. On the 8th fairway of the Makai Ocean '9'. Heated during the winter months. Party room adjacent to the pool and bar-b-q area for your use and enjoyment. Fee for use of the full kitchen and private party. Great place to stay for relaxing and exploring the Princeville area. Everything is as advertise, very clean unit and has all the necessities. Absolutely perfect for a couple looking for a relaxing getaway with all the amenities of home! We were in love with the property as soon as we walked in the doors. A breathtaking view greets you as you enter the living room surrounded by windows. Large master bedroom with view of the ocean. Bathrooms were spotless and the kitchen had everything we needed. This very tastefully done apartment makes you feel right at home. Location is great and within a very short walk is one of the best views on the island! Makai golf course is right out your back door. Will always remember the polar bears! Our stay at Julie's condo at Emmalani Court #221 met and exceeded our expectations. We loved the expansive size of the main living areas and the master bedroom. It didn't feel like a hotel room like so many small condo units. Oh, we absolutely loved the quiet peacefulness of the location! The kitchen is stocked very well and even though we didn't do a lot of cooking it was nice to have what we needed when we did prepare a little something. Loved the big walk in shower in the main bath instead of a the typical bath/shower. Cleanliness is a big thing for us and we appreciated how clean it was. Love the big windows and the wonderful Lani and of course the view is simply amazing! My wife couldn't understand why someone would put carpet in a resort condo, let alone a white carpet but we have to admit it was so nice and homey to remove our shoes and feel comfortable in stocking or bare feet. Unfortunately some of the previous guests haven't been as respectful as they should have been. The only suggestion I might make would be to provide a very light-weight blanket for the beds instead of the heavier comforters. Over all we loved unit 221 and hope to stay here in the future. Thank you Julie. I have vacationed on Kauai 8 times and every time stayed at this Condo. I love how close it is to snorkeling, Hanalei and everything I need. It is clean, updated, spacious and comfortable. I especially love the patio overlooking the ocean and the golf course. I would highly recommend it.